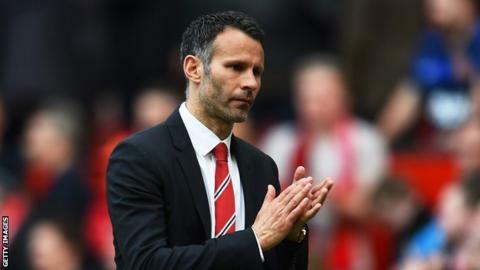 Ryan Giggs could be set for his final Manchester United appearance after admitting he may have to leave to further his coaching ambitions. The 40-year-old, who last played for United in early April, made his debut as a 17-year-old in 1991 and has won 34 trophies at the club. The club's interim boss, asked whether the home match against Hull on Tuesday could be his last chance to play at Old Trafford, said: "It might dawn on me on Monday or Tuesday. Then I might have to put myself on the bench." Giggs has made 962 appearances for United and played in more than 1,000 games when international appearances for Wales are taken into account. "The perfect scenario would be me coming on and scoring but football doesn't work like that," he said. Giggs, now in his 24th season at Old Trafford, was named interim boss following the sacking of David Moyes in April. He ruled out playing for another team but on managing someone else, he said: "You can never say yes or no. "I'm still a young man in relative terms in management." Amid speculation that Louis van Gaal is set to be installed as United manager, Giggs said he would consider playing for another season at the club if the new boss offered to extend his current contract, which expires at the end of June. "It's my decision and whoever comes in, if they want me," he said. Giggs, the most decorated player in English football history last played for United in the 1-1 Champions League quarter-final first leg draw at home to Bayern Munich in April. During his time at United he has won 13 Premier League titles, four FA Cups, three League Cups and two Champions Leagues. With two games remaining this season, United can finish no higher than sixth in the Premier League after Sunderland earned a first league win at Old Trafford since 1968 on Saturday. United entertain Hull on Tuesday before rounding off a trophy-less season at Southampton on 11 May.